Type 303—free machining version of 304 via addition of sulfur and phosphorus. 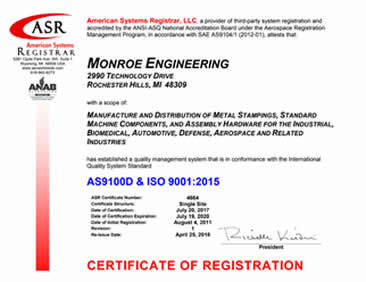 Also referred to as "A1" in accordance with ISO 3506. Type 304—the most common grade; the classic 18/8 (18% chromium, 8% nickel) stainless steel. Outside of the US it is commonly known as "A2 stainless steel", in accordance with ISO 3506 (not to be confused with A2 tool steel). Type 304L—same as the 304 grade but lower carbon content to increase weldability. Is slightly weaker than 304. Type 304LN—same as 304L, but also nitrogen is added to obtain a much higher yield and tensile strength than 304L. Type 308—used as the filler metal when welding 304. Type 309—better temperature resistance than 304, also sometimes used as filler metal when welding dissimilar steels, along with inconel. Type 316L—is an extra low carbon grade of 316, generally used in stainless steel watches and marine applications, as well exclusively in the fabrication of reactor pressure vessels for boiling water reactors, due to its high resistance to corrosion. Also referred to as "A4" in accordance with ISO 3506. Type 316Ti—variant of type 316 that includes titanium for heat resistance. It is used in flexible chimney liners. Type 439—ferritic grade, a higher grade version of 409 used for catalytic converter exhaust sections. Increased chromium for improved high temperature corrosion/oxidation resistance. Type 440—a higher grade of cutlery steel, with more carbon, allowing for much better edge retention when properly heat-treated. It can be hardened to approximately Rockwell 58 hardness, making it one of the hardest stainless steels. Due to its toughness and relatively low cost, most display-only and replica swords or knives are made of 440 stainless. Available in four grades: 440A, 440B, 440C, and the uncommon 440F (free machinable). 440A, having the least amount of carbon in it, is the most stain-resistant; 440C, having the most, is the strongest and is usually considered more desirable in knifemaking than 440A, except for diving or other salt-water applications. 630 through 635: Semiaustenitic and martensitic precipitation hardening stainless steels. Are you looking for custom hinges?